Continuing my USA travel adventure, from Boston I flew to San Francisco. I lived in San Francisco for about 20 years during which there were probably 20 years of controversy over extending BART to San Francisco Airport. Eventually a plan was approved and the extension was opened several years ago. While it works pretty well for trips to San Francisco and the East Bay (although it costs $8.10 now from downtown San Francisco – fairly close to the cost of a shared ride shuttle), the design is really awful for persons heading south on public transport (as predicted by public transport advocates during the planning process). 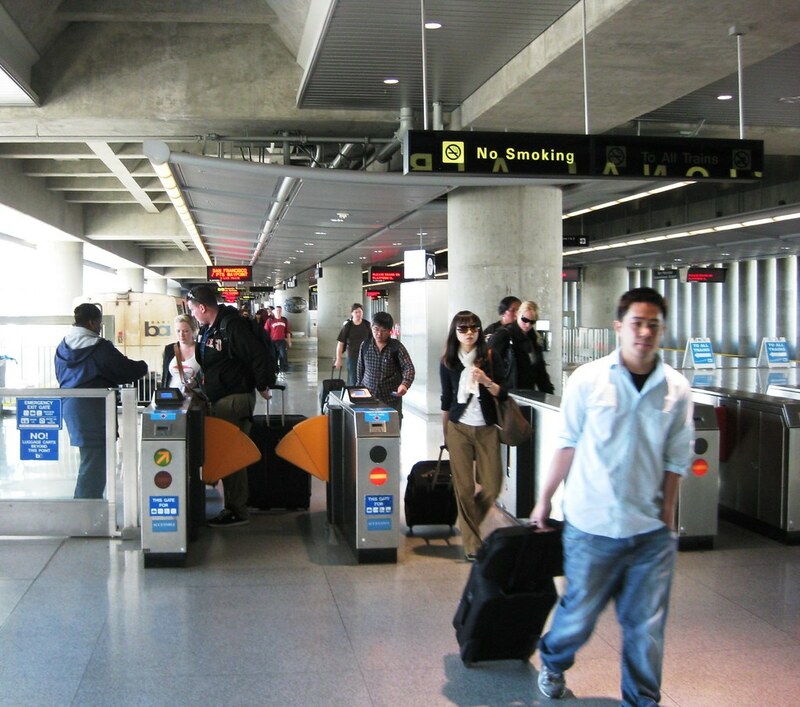 The first problem is ticketing – always a hassle in the San Francisco Bay Area! (See Paul Shigley’s blog.) You need to buy a ticket for BART at the Airport Station ($2, I think the transfer to Caltrain was supposed to be free!). Then, after exiting BART in Millbrae, you need to buy another ticket for Caltrain at the Millbrae station. If the Bay Area public transport operators cannot agree on a common ticketing system (see next paragraph), at least there could be a Caltrain ticket machine at the SFO BART station so that people could save time (and possibly not miss a train – I had this happen more than once! – waiting to buy a ticket at the Caltrain Millbrae station) by buying a ticket there. Or, thinking more creatively, the BART ticket machine could sell a special Caltrain Ticket that could be used on BART and had the Caltrain destination zone information printed on it – one ticket. There are probably lots of other creative solutions to this problem as well. Back to the Bay Area’s perennial problem of common public transport ticketing. It’s really hard for anyone who has traveled outside the USA to understand the problem. Paper-based zone ticket systems have been used in European cities for probably 30-years. It’s simply a question of political will and having a regional agency that is willing to force the different public transport operators to cooperate. The Bay Area’s MTC seems to lack this political power, too bad. It’s important to understand that developing these common ticketing schemes is not easy in European cities either. Many European regions have used incentives such as major capital projects to encourage participation by reticent public transport operators (this was done in Zurich: the voters said no money for the new regional rail system improvements if ticketing and schedules were not coordinated). It seems that in the Bay Area the independent public transport operators have more clout with the federal government capital programming than the regional agency, so they ignore coordination. The Bay Area is rolling out a new electronic stored value card system called TransLink to reduce the need for different tickets. TransLink has been under development for as long as I can remember – while bigger cities like London and NY have already implemented very successful electronic ticketing systems. The second problem with heading south from San Francisco Airport on Caltrain is the linkage between the airport and Caltrain station. BART heads into the airport in a terminal station and then needs to reverse out of the station. 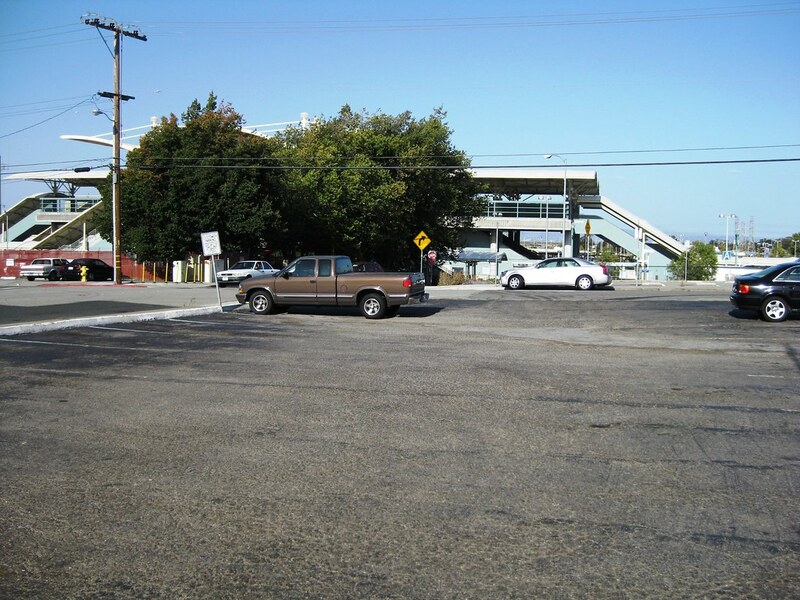 Originally trains reversed out of the station south one stop to the Millbrae BART-Caltrain station throughout the day. Due to budget cuts (? ), trains now only go north from the airport before 7 pm. Here’s a bad photo of the BART map (too much light) showing the operating pattern. 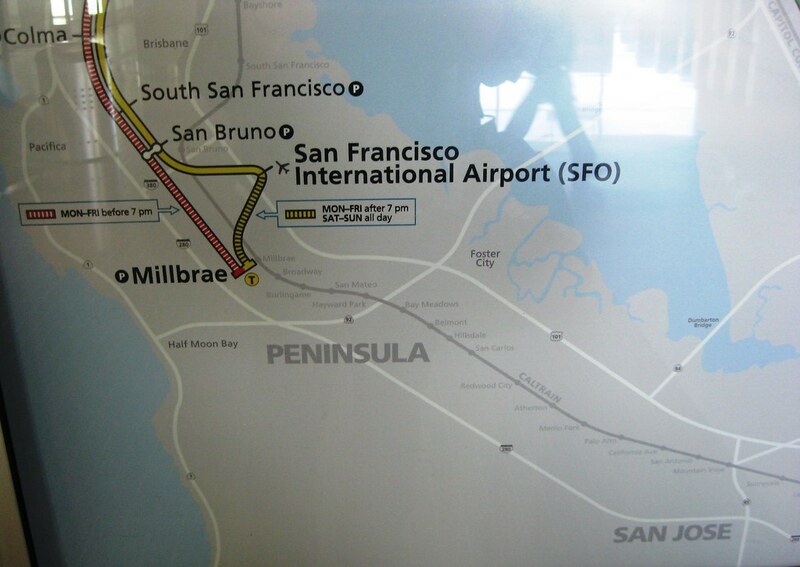 This new operating pattern means that passengers wanting to transfer to Caltrain must take the train north one stop to San Bruno, then wait for a southbound BART train to take them to Millbrae. I arrived at the SFO BART station just as a northbound train pulled into the station. It took a full half hour to make the trip to Millbrae via this route (and it would have been longer if I had had to wait for BART at the SFO station). It’s probably faster to walk to the Millbrae station. Caltrain really should re-implement the shuttle bus system it had before BART was built, this was much more convenient and reliable. This is especially true because the shuttle could be coordinated with the Caltrain schedule. 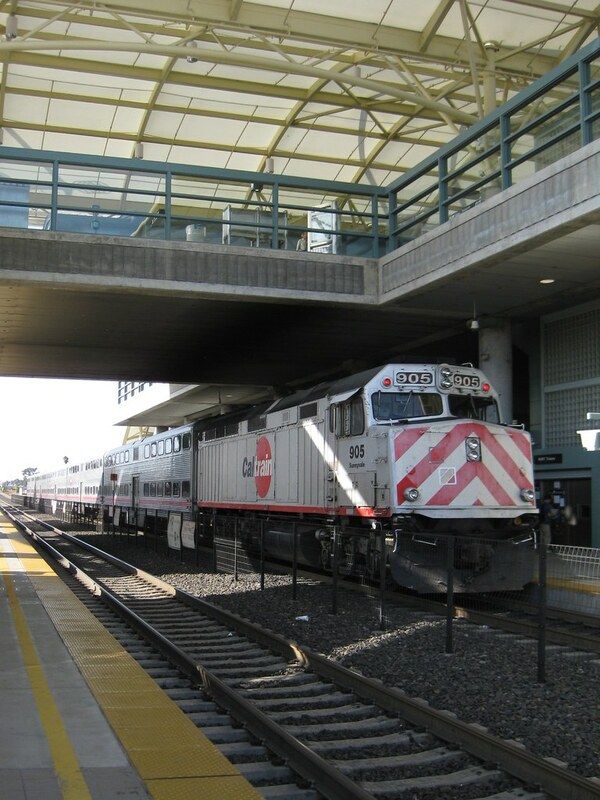 During the day Caltrain runs a combination of express and local trains. It’s possible for you to reach the Millbrae station right after your local train has left and then need to wait for an hour for the next train (this becomes extremely frustrating given the time wasted on the convoluted BART trip to Millbrae from SFO). On my trip I could have taken a local or express train. I missed the local train by about 2 minutes. (Incredibly the local Caltrain trains are scheduled every hour and the BART trains have a regular 15-minute headway … this means that every connection is missed by about 2 minutes!) Since I could take the express train too, I only needed to wait about a half hour at the desolate Millbrae station. There’s probably a good book on transport planning practice to be written on the BART to San Francisco Airport. There are so many lessons that could be learned. I think that the most interesting story is how little power transport planners had in the process of planning the project. The engineering is fine, but the main questions of how the project relates to the overall public transport network on the Peninsula and in the region, were answered in an ugly political process. The results are a badly working system and a myriad of lost opportunities. Nowadays BART Prices also start t increase.But BART services was very useful to San Francisco passengers.